To say the Leica 16-18-21mm f/4 Tri-Elmar ASPH never interested me would be an understatement. From my point of view, Leica came out with this lens, as an update of the then-soon-to-be-discontinued 28-35-50mm f/4 Tri-Elmar ASPH, intended as a transitional fix for the cropped sensor Leica M8. So it's no wonder the 16-18-21mm Tri-Elmar never grabbed my attention. I never got the M8, since a cropped sensor camera wouldn't optimize the full coverage of any M-mount lens. Besides, the Tri-Elmar's angle of coverage was much too wide on a rangefinder. However, this didn't mean I never went wide. If ever I needed a wider angle of coverage on an M-mount rangefinder, I would opt for the 21mm focal length. Admittedly, there wasn't much of a choice. It wasn't as if Leica made a real attempt to go wider than 21mm for many years. Other than a brief blip in the mid 1970s, when disco likely corrupted Leica to adapt the much maligned Zeiss made-for-Leica 15mm f/8 Hologon, 21mm was the widest option offered in the M-mount product range. Clearly, my super-wide lens option was limited to 21mm. As a result, it was only natural for me to play whack-a-mole between existing 21mm lenses, over the years. So by the time Leica released the 16-18-21mm Tri-Elmar, followed by the 18mm f/3.8 Super-Elmar, I didn't even bat an eyelash. I had become so accustomed to the 21mm focal length that I didn't even consider going wider. Instead, I updated to both the 21mm f/3.4 Super-Elmar ASPH and the 21mm f/1.4 Summilux ASPH a couple of years later. My speed round. To get into the mood, I shoot indiscriminately for the first fifty frames. Generally, most of my speed round shots are junked. More speed round. In Central. In bright light and from a distance, everything is likely to be in focus on the Tri-Elmar. In Lan Kwai Fang. I asked Anna to stick her head out into the light, because it was particularly dark inside the stairwell. Although the Tri-Elmar is only 1/3 stop slower than the 21 SEM, a maximum aperture of f/4 makes this lens particular slow in low light situation. As you would expect, the Tri-Elmar is relatively sharp under normal resolution. However, under higher magnification, the Tri-Elmar isn't particularly exceptional in resolving detail. It doesn't have the same sharpness characteristic of Leica's newest generation of lenses, like the APO 50. The colors appear to render with that pop characteristic of Leica lenses. However, this is only the case on Leica sensors (and presumably film). On the Sony A9, the colors were more muted. Anecdotally, I can understand why Leica never appeared interested in going wider than 21mm until the introduction of the M8. From the context of user experience, there wasn't a need. 21mm was as wide as Leica ever went, so shooting at 21mm was what Leica M-photographers learned to master. I cannot speak for other Leica enthusiasts shooting at the 21mm focal length, but a lack of wider options has conditioned me to compose with exceptional proficiency - even without an external viewfinder. In that respect, it's easy to see how 21mm had become the gold standard anchoring the wide end of Leica's product offering. It's what Leica enthusiasts have become accustomed to using. Therefore, it's what they wanted too. In fact, one could even argue the 16-18-21mm Tri-Elmar is an extension of that assertion. On the M8, the Tri-Elmar covers the 21mm equivalence at the widest end. Coincidence? I think not. From my perspective, Leica must have believed 21mm was so indispensable to their core customer, that they had to offer it with the cropped sensor M8 - albeit sprinkled with the option of two additional focal lengths. Likewise, on a full framed sensor, the 16-18-21mm Tri-Elmar also covers the 21mm focal range. Again, I don't believe it was a coincidence either. If I had to make a guess, I'd say Leica wanted to widen their product line, but was uncertain how Leica enthusiasts would receive a super-wide angle lens wider than their standard 21mm focal length. Given the uncertainty, Leica gave the Tri-Elmar 21mm training wheels, in a manner of speaking. This way, the Tri-Elmar could be regarded as a 21mm lens with the option of going wider. Perhaps my eyes are playing tricks, but I detect very slight barrel distortion - albeit faint. Not all the lines are plumb straight. In my opinion, contrast holds up well, even when the image is underexposed (because of backlighting in this case). Exposure corrected in post. Contrast also holds up well, even when the image is overexposed. Exposure corrected in post. Too wide to pan at 1/30s, f/4, and 3' (roughly 1m) away. Also, notice the vignetting. A view of Admiralty and Central on the right side. Probably shot at 16mm. At 16mm shooting from around 30' (10m) away, it's easy to get everything in focus - even wide open at f/4. In approaching the 16-18-21mm Tri-Elmar as a 21mm lens with options, a reasonable way to understand it would be to compare it to the next closest lens on the Leica product range. That is the very popular 21mm f/3.4 Super-Elmar. When you frame the Tri-Elmar in that context, you begin to see how familiar the Tri-Elmar is, from a Leica enthusiast's perspective. After all, it's just a 21mm lens with the option of going wider. Still, a Leica enthusiast will likely find the Tri-Elmar to be too big and too slow. But to be fair to the Tri-Elmar, the difference really isn't all that obtrusive. It's 50mg more than the 21 SEM, which means the Tri-Elmar weighs as much as the 50mm f/1.4 Summilux ASPH - give or take. Furthermore, the 21 SEM is only marginally faster than the Tri-Elmar by roughly 1/3 of a stop. Still faster is faster, and smaller is smaller... but not by much. Despite what appears to be demonstrably minor differences, it's likely that Leica enthusiasts remain unconvinced. Perhaps it's the tradeoff the Tri-Elmar includes. Giving up speed and compactness for the sake of flexibility may not be worth it, especially since the standard 21mm focal length is already wide enough. So from that perspective, it doesn't make sense to carry extra weight for two additional angles of coverage, which will never be used. If one needs 18mm or 16mm, all one needs to do is take a step back - unless if you're back is already up against a wall of a very small room. 18 point sun star. I don't think a 21mm lens would have gotten this much coverage. Comparison of distortion. at 6' (roughly 2m) away. Now at 3' (roughly 1m) away. Nearing the golden hour, with Admiralty to Wan Chai in the background. The skyline is not completely sharp, given the heat wave distorting objects at a distance. It was 95°F (roughly 35°C) that day. Now a comparison of focal length. This was shot at 21mm - probably? This was shot at 16mm, and 6' (roughly 2m) closer than the image before (I think). Compared to the previous image, the same amount of background was documented at a wider angle, shot at a closer distance. To be perfectly frank, I really don't know what the difference is between shooting at 21mm or 16mm. In my opinion, super-wide is super-wide, and the only perceptible difference I observed between two super-wide focal lengths is the resulting image captured at the closest focusing distance. In other words, if I wanted to capture an image at the 21mm focal length to resemble an image captured at the 16mm focal length at the minimum focusing distance, all I need to do is take a step back or two. However, I wouldn't be able to do the reverse. That is to say, I wouldn't be able to capture an image with the 16mm focal length to resemble an image captured at the 21mm focal length at the minimum focusing distance. In other words, I wouldn't be able to step close enough to the subject to accomplish that, since I wouldn't be able to focus any closer than the minimum focusing distance. Still, I cannot deny the Tri-Elmar at 16mm can go wider - if you're really paying attention to it - which I didn't. When shot close to minimum focusing distance at 16mm, the angle of coverage is generous enough to capture a significant amount of background in-frame. Becoming a victim of photobombing between the camera and the subject is non-existent. Moreover, photobombing from behind the subject is significantly less of an concern, given how much objects shrinks at 16mm the further away they are from the camera. Waist level shot blindly. It's almost impossible not to capture something at such wide angles. Image has been cropped for leveling. Playing with distortion. 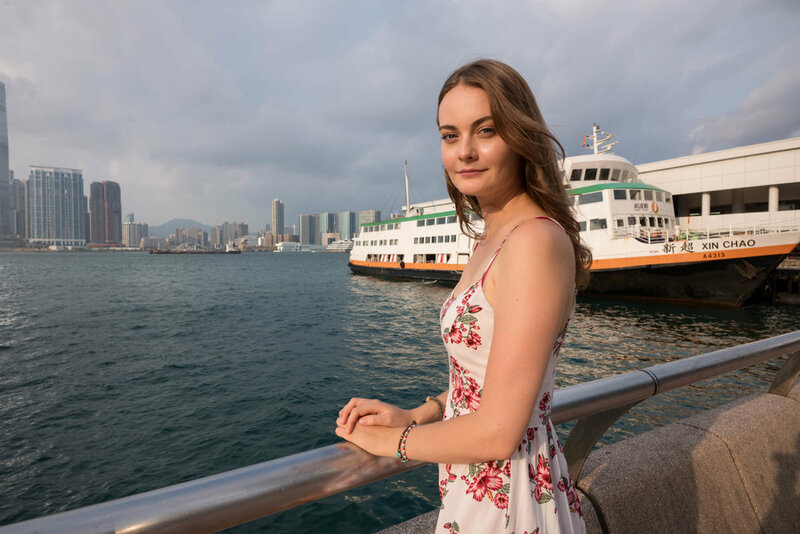 I asked Anna to lean slightly over the railing (without falling over) in order to center her head in the frame (to minimize distortion), while positioning her torso to the right, in order to have more water covering the composition than promenade. Taking advantage of the wind. Again, Anna's torso is tilted to place her head closer to the center of the frame. More wind. With the wide depth of field, it didn't matter that Anna was moving around. I admit, most of the sample images in this review were shot at 16mm. There were a couple of images shot at 18mm and 21mm. But there is no way for me to provide that detail, since the M10 only records the 16mm focal length by default. And it's not as if I can eye-ball which images were shot at which focal length. As I said, there really isn't much perceptible differences between focal length, unless you're looking for it. Which brings me to my next point. If the difference between the 16mm focal length isn't perceptibly differently from the 21mm focal length, why would Leica enthusiasts continue to marginalize the Tri-Elmar? Having become acquainted with this lens, I am now convinced by how useful it is. It is by far more useful than the 21 SEM. I love how I can shoot closer to the subject and still document more of the background at a much wider angle of coverage. If all I lose is 1/3 of a stop, swell 50mg, and stick-out a finger's width more, I believe the tradeoff for 16mm is well worth it. Plus, if 16mm isn't working out for me, I can always revert back to the comfort and familiarity of my beloved 21mm training wheels. Overall, the Tri-Elmar is a phenomenally good lens. It's sharp at normal resolution, and it's noticeably contrasty in rendering. The lens does exhibit minor signs of barrel distortion, as well as lens flares from certain angles, vignetting at maximum aperture, and even chromatic aberration at high magnification (which surprised me). However, none of this detracts from the performance of the lens. When paired with the live-view of the Leica M10, the ease of accurate framing plus the generous depth of field (characteristic of a super-wide lens) make the Tri-Elmar a particularly adept documentary tool. Now more wind, walking towards the camera. In front of a newsstand by Central Pier with the vender visible behind Anna. Now the vendor is hidden behind Anna. At 16mm, objects at a distance behind the subject are miniaturized - resulting in greater control over the composition. You may have noticed that I spent a considerable amount of effort on this blog post rationalizing the 16-18-21mm f/4 Tri-Elmar ASPH. From my perspective, I believe it was more important to address the elephant in the room, which was why this lens is often overlooked. Personally, I believe the sentiment is a holdover deriving from the inconvenience of framing super-wide angles on a rangefinder. But now with the prevalence of live-view, particularly on the Leica M10, framing at super-wide angle isn't much of an annoyance anymore. Besides, this lens is more than ten years old. There are probably oodles of technical reviews out there already. For more on the 16-18-21mm f/4 Tri-Elmar ASPH, please click here for the previous blog post. There are two examples of comparative focal lengths of the lens' three angle of coverage. All images shot on the Leica M10. All images have been optimized in Lightroom. All body images have not been cropped.